Sennheiser is not just a brand, it is a standard and I have been an avid fan of their products. Headsets form a necessary part of any gaming experience. The GAME ONE headset definitely enhances that experience. Wearing these headphones during games has made them such a wholesome experience. Its audio capabilities are flawless – top notch sound with great bass and not to mention, some crisp and pristine clarity. 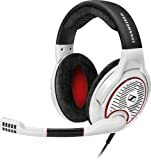 If you are looking for a pair of headphones that will let you lose yourself in the story and feel of the game then you just cannot go wrong with these. They are very convenient and as a gamer who loves to have a full-fledged experience, I personally found GAME ONE the best way to get it other than using a headset such as the Logitech G933 or Razer Kraken. The headphones essentially cut off all the noise which creates one of the most outstanding experiences. I have never experienced the same level of audio clarity with any other pair of headphones. Another notable feature of these headphones that enhances gameplay is their microphone – it is phenomenal. My voice was clearly transmitted to the other end without any issues. I have received comments like “oh, you sound so much clearer today!” and I can thank Sennheiser for this. The microphone does not transfer any background noise either which is great for having clear conversations. Another feature that I really like about the microphone is its automatic mute system. Just raise the microphone up and it will automatically mute. These headphones are clearly much lighter than what I have tried till now. They sport an open back design which is great for summers as I hate sweating. What I love even more about the design is their ear pads. They are huge and extremely comfortable. They also fit quite snugly and I could move my neck quite easily with them on. Unlike other headphones, the GAME ONE headset is not going to put excessive pressure on your head and neck after wearing them for hours. I don’t really care about looks if devices perform well but the Sennheiser GAME ONE is really good looking. They are stylish and have a modern appearance which although does not contribute to the experience but is a point worth mentioning. These headphones come with a long wire which is very convenient since I like to get up and stretch a bit every now and then. Also, it is replaceable so if the current wire shows some signs of damage, you can easily get yourself a new wire and replace it. I love how there is a two-year warranty for GAME ONE because they are expensive. I spent a lot of money on them and I find the results well worth my investment. The two-year warranty is like an official security and makes me feel like my money has been well spent. Highly recommended. Highly recommended headset, with a very neat looking chunky design. High quality performance, with strong audio clarity. Priced at a reasonable price point.